According to the district, 2,169 teachers have walked off the job as of 8:15 a.m. Some students have also walked out of class to show support for the teachers strike in Denver. 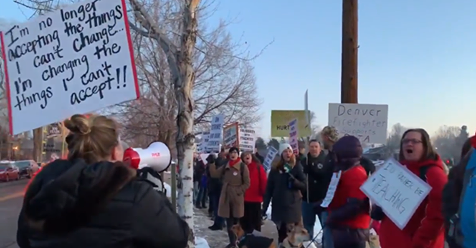 Teachers picketing in front of South High School on Monday, February 11, 2019. According to district spokesperson Will Jones, as of 8:15 a.m., 2,169 teachers have walked off the job. Teachers are striking over the way the district’s compensation money is spent – the district has offered to put millions into incentives, but teachers are demanding that money be used to beef up the district’s base pay model for teachers. Feb. 11 – 8:10 a.m.
Sign roundup! Below you’ll see a collection of various signs from the teachers strike. We’ll do this throughout the day. Feb. 11 – 8 a.m.
As far as Hamilton is concerned, 800 students will be divided up into the auditorium, the gymnasium and the cafeteria for class. Six licensed substitute teachers were assigned there. As of 8 a.m., the teachers striking outside of Hamilton walked down the street to Holm Elementary to support the teachers there. Classes are underway there with subs taking over. Follow 9NEWS reporter Jon Glasgow for more. Feb. 11 – 7:35 a.m. The library said in a Facebook post that it was working with the mayor, the district and the parks department to provide resources and help to students and families during the strike. Feb. 11 – 7:25 a.m.